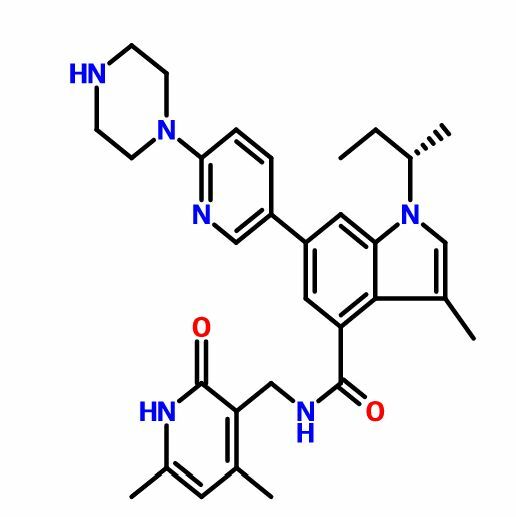 An histone-lysine n-methyltransferase EZH2 inhibitor potentially for the treatment of B-cell lymphoma. GSK-126 is an inhibitor of mutant EZH2, a histone methyltransferase (HMT) that exhibits point mutations at key residues Tyr641 and Ala677; this compound does not appreciably affect WT EZH2. EZH2 is responsible for modulating expression of a variety of genes. 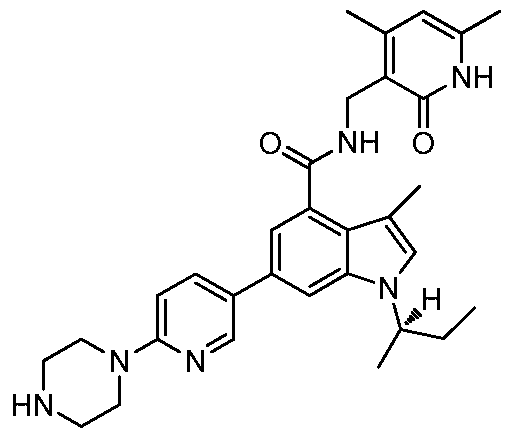 GSK-126 competes with cofactor S-adenylmethionine (SAM) for binding to EZH2. GSK-126 displays anticancer chemotherapeutic activity by inhibiting proliferation in in vitro and in vivo models of diffuse large B-cell lymphoma. 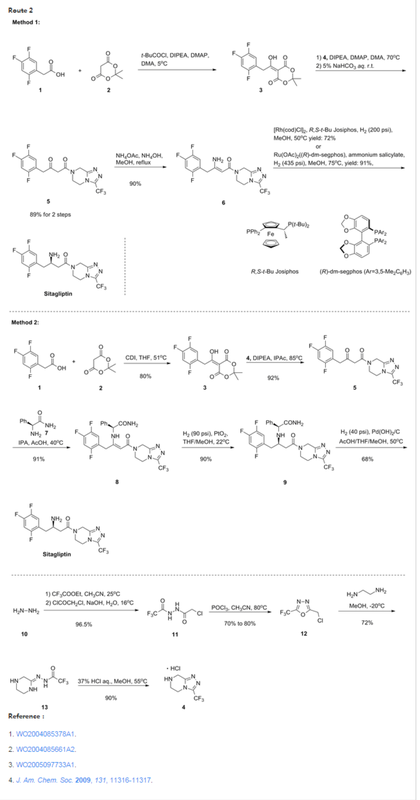 Example 79: Add (S) in a three-necked flask 100 Qiu – bromo – Shu – (isobutyl) – N – ((4,6-dimethyl-2-oxo -l, 2- dihydropyridin-3-yl) methyl) -3-methyl-1 hydrogen – indole carboxamide (365mg, 0.82mmol), 2- (piperazin-1-yl) pyridine-5-boronic acid pinacol ester (309mg, 1.07mmol, 1 · 3eq), potassium phosphate (522mg, 2.46mmol, 3eq), water, and I, 4- diepoxy-hexadecane as the solvent. 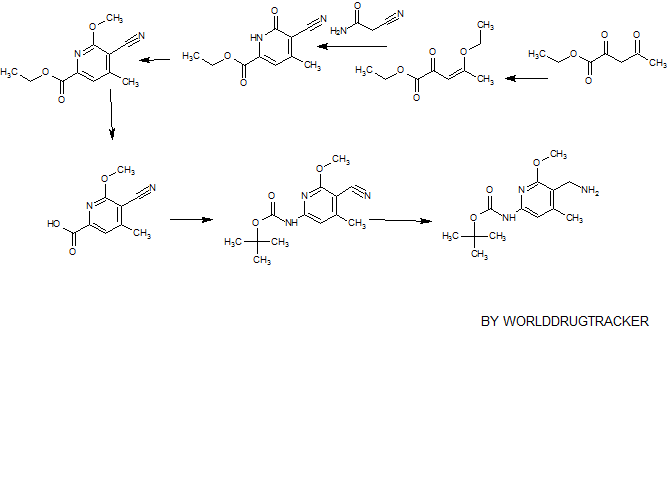 Then, under nitrogen was added [I, Γ- bis (diphenylphosphino) ferrocene] dichloropalladium (II) dichloromethane complex (53.9mg, 0.066mmo 1), and at 90 ° C reaction, to give the desired product after purification 400mg (92% yield). 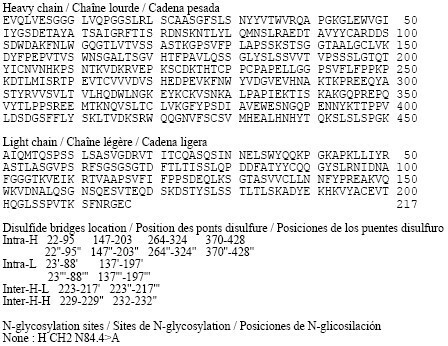 Goo NMR (500MHz, DMSO- (I6) JO.70-0 · 78 (ιή, 3H), 1.37-1.44 (m, 4H), 1.75-1.87 (m, 2H), 2.11 (s, 3H), 2.16 ( s, 3H), 2.22-2.27 (m, 3H), 2.77-2.85 (m, 4H), 3.41-3.49 (m, 4H), 4.35 (d, J = 5.31Hz, 2H), 4.56-4.68 (m, lH), 5.87 (s, 1H), 6.88 (d, J = 8.84Hz, 1H), 7.17 (d J = 1.52Hz, 1H), 7.26 (s, lH), 7.73 (d J = 1.26Hz, 1H) , 7.91 (dd, J = 8.84Hz, lH), 8.16 (t, J = 5.05Hz, lH), 8.50 (d, J = 2.53Hz, lH); 13C NMR (125MHz, DMSO- (I6) Sll .6 , 12.6,19.1, 19.9,21.7,30.4,35.9,46.3,46.9,52.4,107.6,108.2,108.5,110.6,116.9,122.6,123.8, 130.6,131.5,136.7,138.6,143.5,146.4,150.2,159.2,164.0 , 169.6. (isocratic)). For each run, 100 mg of the racemic compound was dissolved in 30 volumes (3.0 ml.) of warm ethanol with a few drops of isopropylamine added. A total of 19 runs were performed. Baseline resolution was observed for each run. The isomer that eluted at 8.3-10.1 min was collected (following concentration) as a white solid, which was dried at 50 °C (< 5 mm Hg) to afford 901 mg, and was determined to be the S isomer* (Ex. 267; chiral HPLC: >99.5% ee (no R isomer detected). The isomer that eluted at 10.8-13.0 min was collected as a white solid, which was dried at 50 °C (< 5 mm Hg) to afford 865 mg, and was determined to be the R isomer* (Ex. 268; chiral HPLC: 99.2% ee; 0.4% S isomer detected). 1H NMR and LCMS were consistent with the parent racemate. 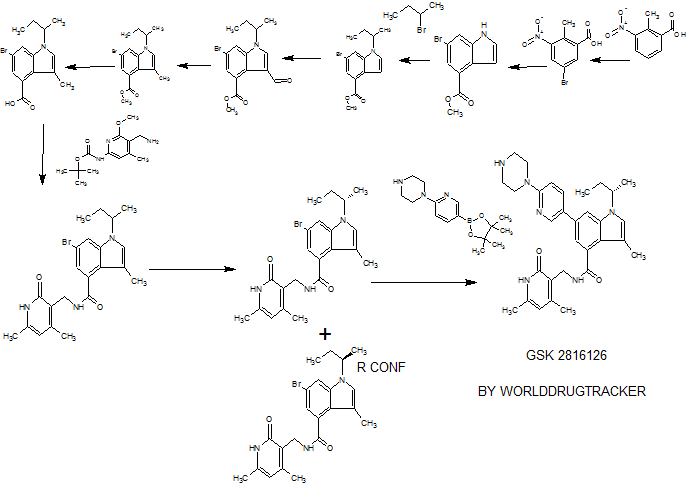 * The absolute configuration was determined by an independent synthesis of each enantiomer from the corresponding commercially available homochiral alcohols via Mitsunobu reaction. The sterochemical assignments were also consistent by vibrational circular dichroism (VCD) analysis. Dichloromethane, B: 10% (2M Ammonia in Methanol) in Chloroform, Gradient B: 8- 95%). The obtained solid was concentrated from TBME and dried in vacuum oven at 45 °C for 18 h. The product was collected as 129 mg (70%). 1H NMR (400 MHz, DMSO-d6) δ ppm 0.73 (t, J=7.33 Hz, 3H), 1.40 (d, J=6.57 Hz, 3H), 1.80 (dq, J=10.07, 7.08 Hz, 2H), 2.1 1 (s, 3H), 2.14 – 2.19 (m, 3H), 2.24 (s, 3H), 2.76 – 2.85 (m, 4H), 3.41 – 3.49 (m, 4H), 4.35 (d, J=5.05 Hz, 2H), 4.54 – 4.67 (m, 1 H), 5.87 (s, 1 H), 6.88 (d, J=8.84 Hz, 1 H), 7.17 (d, J=1.26 Hz, 1 H), 7.26 (s, 1 H), 7.73 (d, J=1.26 Hz, 1 H), 7.91 (dd, J=8.84, 2.53 Hz, 1 H), 8.16 (t, J=5.05 Hz, 1 H), 8.50 (d, J=2.53 Hz, 1 H), 1 1.48 (br. s.,1 H) ; LCMS MH+ =527.3. 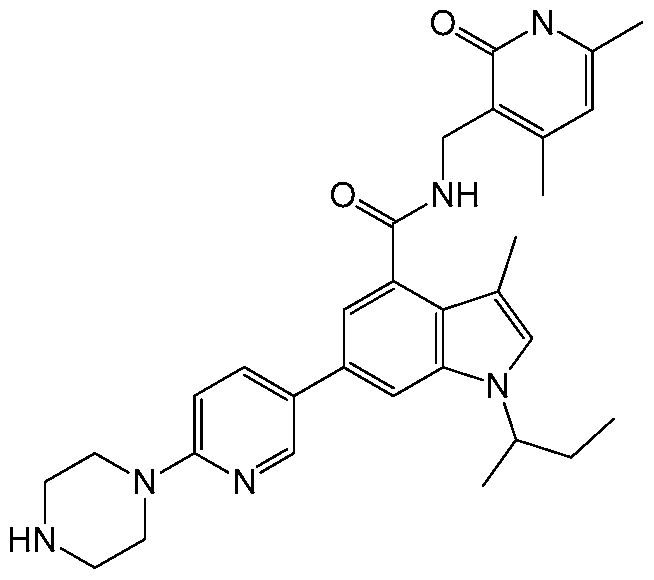 ACN/H20, 0.1 % NH4OH ) to give 91 mg of product as off-white solid. 1 H NMR (400 MHz, DMSO-d6) δ ppm 0.70 – 0.78 (m, 3H), 1.37 – 1.44 (m, 3H), 1 .75 – 1.87 (m, 2H), 2.1 1 (s, 3H), 2.16 (s, 3H), 2.22 – 2.27 (m, 3H), 2.77 – 2.85 (m, 4H), 3.41 – 3.49 (m, 4H), 4.35 (d, J=5.31 Hz, 2H), 4.56 – 4.68 (m, 1 H), 5.87 (s, 1 H), 6.88 (d, J=8.84 Hz, 1 H), 7.17 (d, J=1.52 Hz, 1 H), 7.26 (s, 1 H), 7.73 (d, J=1.26 Hz, 1 H), 7.91 (dd, J=8.84, 2.53 Hz, 1 H), 8.16 (t, J=5.05 Hz, 1 H), 8.50 (d, J=2.53 Hz, 1 H); LCMS: 527.8 (MH+). To a 30 niL microwave vial were added (S)-6-bromo-l-(sec-butyl)-N-((4,6-dimethyl-2-oxo-l,2-dihydropyridin-3-yl)methyl)-3 -methyl- lH-indole-4-carboxamide (100 mg, 0.225 mmol), l-(5-(4,4,5,5-tetramethyl-l,3,2-dioxaborolan-2-yl)pyridin-2-yl)piperazine (85 mg, 0.293 mmol), 1 ,2-Dimethoxyethane (DME) (3 mL), water (1.000 mL) and sodium carbonate (0.338 mL, 0.675 mmol), and the mixture was degassed for 5 min by bubbling nitrogen. PdCi2(dppf)-CH2Ci2 adduct (14.70 mg, 0.018 mmol) was added and the tube was sealed. The mixture was irradiated (microwave) at 140 °C for 10 min. The mixture was concentrated and the residue was taken up into MeOH and filtered. The filtrate was purified using reverse-phase HPLC (eluent: 25%ACN/H20, 0.1% NH4OH to 60% ACN/H20, 0.1% NH4OH ) to give 91 mg of product as off-white solid. 1H NMR (400 MHz, DMSO-d6) δ ppm 0.70 – 0.78 (m, 3H), 1.37 – 1.44 (m, 3H), 1.75 – 1.87 (m, 2H), 2.11 (s, 3H), 2.16 (s, 3H), 2.22 – 2.27 (m, 3H), 2.77 – 2.85 (m, 4H), 3.41 – 3.49 (m, 4H), 4.35 (d, J=5.31 Hz, 2H), 4.56 – 4.68 (m, IH), 5.87 (s, IH), 6.88 (d, J=8.84 Hz, IH), 7.17 (d, J=1.52 Hz, IH), 7.26 (s, IH), 7.73 (d, J=1.26 Hz, IH), 7.91 (dd, J=8.84, 2.53 Hz, IH), 8.16 (t, J=5.05 Hz, IH), 8.50 (d, J=2.53 Hz, IH); LCMS: 527.8 (MH+). To a 30 mL microwave vial were added (R)-6-bromo-l-(sec-butyl)-N-((4,6-dimethyl-2-oxo-l,2-dihydropyridin-3-yl)methyl)-3 -methyl- lH-indole-4-carboxamide (100 mg, 0.225 mmol), l-(5-(4,4,5,5-tetramethyl-l,3,2-dioxaborolan-2-yl)pyridin-2-yl)piperazine (85 mg, 0.293 mmol), 1 ,2-Dimethoxyethane (DME) (3 mL), water (1.000 mL) and sodium carbonate (0.338 mL, 0.675 mmol), and the mixture was degassed for 5 min by bubbling nitrogen. PdCl2(dppf)-CH2Cl2 adduct (14.70 mg, 0.018 mmol) was added and the tube was sealed. The mixture was irradiated (microwave) at 140 °C for 10 min. The mixture was concentrated and the residue was taken up into MeOH and filtered. The filtrate was purified using reverse-phase HPLC (eluent: 25%ACN/H20, 0.1% NH4OH to 60% ACN/H20, 0.1% NH4OH ) to give 90 mg of product as off-white solid. 1H NMR (400 MHz, DMSO-d6) δ ppm 0.73 (m, 3H), 1.41 (d, J=6.57 Hz, 3H), 1.81 (td, J=7.14, 2.91 Hz, 2H), 2.11 (s, 3H), 2.15 – 2.20 (m, 3H), 2.24 (s, 3H), 2.77 – 2.83 (m, 4H), 3.41 – 3.49 (m, 4H), 4.35 (d, J=5.05 Hz, 2H), 4.54 -4.68 (m, 1H), 5.87 (s, 1H), 6.88 (d, J=8.84 Hz, 1H), 7.17 (d, J=1.52 Hz, 1H), 7.26 (s, 1H), 7.73 (d, J=1.26 Hz, 1H), 7.91 (dd, J=8.84, 2.53 Hz, 1H), 8.16 (t, J=5.05 Hz, 1H), 8.50 (d, J=2.27 Hz, 1H); LCMS: 527.7 (MH+). Tian X, Zhang S, Liu HM, et al. Histone lysine-specific methyltransferases and demethylases in carcinogenesis: new targets for cancer therapy and prevention. Curr Cancer Drug Targets. 2013 Jun 10;13(5):558-79. PMID: 23713993. McCabe MT, Ott HM, Ganji G, et al. EZH2 inhibition as a therapeutic strategy for lymphoma with EZH2-activating mutations. Nature. 2012 Dec 6;492(7427):108-12. PMID: 23051747. By DR ANTHONY MELVIN CRASTO Ph.D in PHASE1, Uncategorized on June 14, 2016 .